If you’ve ever traveled overseas then you know the deal. Because of the time difference you’re supposed to sleep on the plane so that you wake up perfectly refreshed when you land in your new timezone. Too bad I can never follow directions! I don’t know if it was the excitement, or the fact that I was working nonstop for weeks before this trip but even though my body was tired, my mind was like, “we usually don’t go to sleep until 3 am.” So there I was, awake while everyone around me was sound asleep. At least British Airways gives you a laptop full of movies. We landed and immediately checked our phones (obviously). Panicked slightly until we got a strong wifi connection, and then got a gentle lecture from a Parisian couple to look out for pick pockets. I was going to tell her that I deal with that everyday taking the Uptown 1 train in New York City, but instead I just thanked her. After checking into our gorgeous apartment in the Bastille district of Paris, beautiful sleep finally hit me. So while the other girls made their way out to get some food and start exploring, I was busy at Club Cama, listening to DJ Almuada. I don’t know how long I slept before my ears started picking up the familiar sound of deep, throbbing bass. As I slowly started drifting awake, the bass was followed by hoots and screams of happy (drunk) people. Now I’m sitting up in bed, confused, because where the heck am I?! I thought this was supposed to be refined Paris! I made an executive decision (ha) to get myself out of bed and check out what was going on. 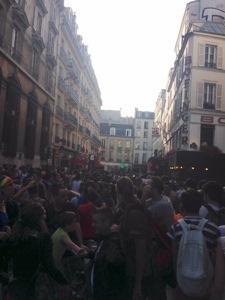 I left a note for the girls, walked outside and stumbled smack into the Techno Parade of Paris. It’s only held one day a year, and that happened to be today and outside my door! I thought I had been transported back to Ibiza for a minute. 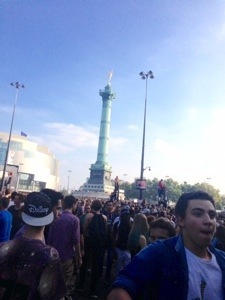 But nope, I was in Paris, and this parade was in full effect. So off I went to explore on my own in a country whose language I sadly knew little of. As I’m trying to make my way through this crazy crowd, this handsome man helps to pull me across the street so that I don’t get trampled, and I meet my first friend in Paris. Stranger: No, very little English. Me: (In my mind) Oh well. I smiled and we started dancing. A few things I noticed. First, so many things going on in this parade would never, ever happen in the U.S. The amount of people just freely climbing parked cars, light poles, and each other while the floats came dangerously close to us was crazy. No streets roped off. No police to tell you to cross here and only here. It was a free-flowing crowd and while my heart might have stopped a bit, nothing happened. Were there fights? Of course, but nothing major. It seemed to me at least, that the majority of the people there were just there to listen to the music and dance. And dance we did! Day 1 in Paris was an amazing success! 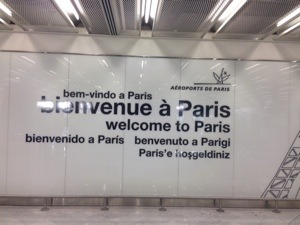 Ok, there’s still so much to blog about Paris, can’t wait to share with you what else I did. Next story Step 3: Do you know where to go if you need medical attention? Previous story I have medical insurance, now what? Step 2: Understanding your insurance.